Plaintiff's motion in limine concerning settlement licenses for patents other than the patents-in-suit was granted in part and the court rejected defendant's argument that ResQNet.com, Inc. v. Lansa, Inc., 594 F.3d 860 (Fed. Cir. 2010) "changed the rules for admissibility of settlement agreements." "In ResQNet . . . the court’s comment that a litigation license was 'the most reliable license' was made in the context of evaluating an expert’s reliance on allegedly comparable licenses under the first Georgia-Pacific factor. That 'factor considers only past and present licenses to the actual patent and the actual claims in litigation' . . . Here, Plaintiff’s expert is utilizing purportedly comparable licenses based on the twelfth Georgia-Pacific factor, i.e., consideration of '[t]he portion of the profit or of the selling price that may be customary in the particular business or in comparable businesses to allow for the use of the invention or analogous inventions.' Finally, the Court notes the litigation licenses in ResQNet did not raise the concern of jury confusion because they had been admitted during a bench trial, whereas the parties here will try this case to a jury. . . . ResQNet is distinguishable and does not compel the admission of evidence and testimony relating to settlement agreements in prior litigation. . . . Parties enter into settlements for a number of reasons 'other than the value of the improvements patented'. . . Thus, admission of these agreements would 'invite a "minitrial" on similarities and differences in the facts' between this case and the settled claims. Such a diversion would cause unfair prejudice, confuse the issues, and waste time." Simonian Reloads with Amended False Marking Complaints, But Will They Pass Muster? Since December 30, 2009, enterprising plaintiffs have filed more than 180 false marking cases. Approximately 84% of the new cases allege expired patents as the basis for the false marking claim. Leading the charge is Thomas Simonian of Geneva, Illinois who has filed 37 cases against 43 defendants claiming expired patents as the basis for his false marking claims. Yet, as the number of new expired patent cases continues to grow, many unanswered questions remain, including whether an expired patent may serve as the basis for a false marking claim. When a product is marked with an expired patent number, any person with basic knowledge of the patent system can look up the patent and determine its expiration date, reducing the potential for being deceived. To the extent the relevant public consists of potential competitors, Judge Brinkema’s observation seems right on target. Are potential competitors likely to be deceived by an expired patent number when the fact of expiration can be determined quickly and easily via free online information? The expiration date of a U.S. Patent is not readily ascertainable by members of the public at the time of product purchase. The patent number itself does not provide members of the public with the expiration date of the patent. Basic information about a patent, such as the filing, issue and priority dates associated with a particular U.S. patent number are available at, for example, the website of the United States Patent and Trademark Office, (“USPTO”). However, access to the Internet is necessary to retrieve that information (meaning that a consumer may not have the ability to retrieve the information while he is in a store making a purchasing decision) and even after retrieving that information, it does not include the expiration date of a patent. Rather, a member of the public must also conduct a burdensome legal analysis, requiring specific knowledge of U.S. patent laws regarding patent term expiration ... Notably, a correct calculation of the expiration date must also account for at least: a) any term extensions granted by the USPTO, which may or may not be present on the face of the patent, and b) whether or not the Patent owner has paid the necessary maintenance fees. Simonian v. Novartis Animal Health US, Inc., 1-10-cv-01267 (ILND) Amended Complaint filed April 27, 2010. Mr. Simonian’s new allegations have some initial appeal. Unlike potential competitors, most consumers lack the desire or means to check the expiration date of patent numbers at the point of purchase. Lacking this corrective information, they are vulnerable to being deceived. Problem solved? Maybe not. Focusing on the consumer at the point of sale might avoid one problem, but it raises another: To what extent, if any, does marking a product with a patent number impact a consumer’s purchasing decision? While this question could no doubt provide fodder for vigorous competing expert opinion, the author submits that the answer in nearly every instance is none. If that’s the right answer, then it’s difficult to see how consumers would be deceived by incorrect patent marking. Traditional notions of fraud and deception generally require some form or reliance and reliance is lacking if consumers don’t care about patent numbers or expiration dates. As the law of false marking continues to develop, these are only a few of the interesting questions that will be addressed. If nothing else, Mr. Simonian’s new allegations take us one step closer to some answers. To view all currently active False Marking cases, please see our complimentary charts at Gray On Claims. The Federal Circuit remanded the court's false marking fine of $500 so that the court could impose a separate fine for each article. On remand, the court recalculated damages at $180 per article. "[Plaintiff] sold the falsely-marked stilts at prices between $103.00 and $180.00. The Court finds that the appropriate fine in this case is $180.00 per article, the highest point of the price range. This will deprive [plaintiff] of more than it received for the falsely-marked stilts, fulfilling the deterrent goal of § 292’s fine provision." In determining plaintiff's patent was unenforceable following a trial on inequitable conduct, the court rejected prosecution counsel's explanation that a failure to notify was a result of his workload and not an intent to deceive. "Although [the inventor's] conduct suffices to support a finding of inequitable conduct, [prosecution counsel's] actions also independently justify an inequitable conduct finding. . . . When confronted about his failure to notify [the examiner] about the rejections in the [related] Applications, [counsel] stated that he had roughly 170 open applications on his docket during the prosecution of the [application of the patent-in-suit]. Any possible weight that the Court could have given this explanation was significantly diminished when [counsel] subsequently admitted that at the time [one prior art] Reference was cited in [one of the related applications], he had less than a handful on his docket belonging to [the inventor]." On April 27, 2010, an individual from Texas filed a complaint for False Marking against Koehn Marketing, Inc., a company whose principal place of business is in South Dakota, but markets “unique livestock equipment” via the internet. With the huge number of False Marking cases filed since the Federal Circuit’s Forest Group decision on December 28th of last year, such filings are becoming almost an everyday occurrence. This particular complaint comes with a twist though. In addition to dual counts of False Marking with a patent that was out of scope AND expired, the plaintiff also accuses Koehn of “personal injuries arising from the use [of] a Sorting Stix manufactured and distributed by Defendant.” Sorting Stix is, apparently, a flexible fiberglass rod used in handling cattle. On or about March 26, 2009, Plaintiff was in the process of working with cattle. Specifically, he was attempting to herd a bull from a pasture through a gate. During this process, Plaintiff was utilizing a Sorting Stix product manufactured and distributed by Defendant. While attempting to herd the bull, Plaintiff threw the Sorting Stix at the bull from a distance of approximately fifteen (15) feet. The Sorting Stix rebounded after striking the bull and struck Plaintiff in the face with sufficient force to rupture and collapse his right eye and cause fractures to the facial bones surrounding his right eye. As a result, Plaintiff has lost his entire right eye. To view this complaint, and all other currently active False Marking case complaints, please see our complimentary charts at Gray On Claims. The court denied in part plaintiffs' motion to dismiss defendants' inequitable conduct defenses for failing to plead that the undisclosed references were not cumulative. "Plaintiffs . . . Argue that the affirmative defense and counterclaim . . . Merit dismissal because Defendants do not allege why the omitted references . . . Are not cumulative of any other prior art, as required by [Exergen Corp. v. Wal-Mart Stores, Inc., 575 F.3d 1312, 1326 (Fed. Cir. 2009)]. . . . This Court does not read Exergen as imposing a strict requirement that pleadings include the word 'non-cumulative' in order to plead inequitable conduct with the requisite particularity. . . . In light of Rule 9(b)’s goals, the pertinent inquiry on Plaintiffs’ motion to dismiss is not whether Defendants used certain magic words, but whether Defendants pled the who, what, when, where, why, and how of the allegedly material omissions in sufficient detail to give Plaintiffs fair notice of the basis for their inequitable conduct claims. With respect to materiality and non-cumulativeness, the pleading must put Plaintiffs on notice as to what information Defendants contend should have been before the examiner but wasn’t and how that information would have changed the examiner’s decision regarding the patentability of the claims in the [patent-in-suit]." The court disqualified defendants' counsel because "other attorneys associated with their firm [previously] represented plaintiff," in connection with oppositions to foreign patent applications involving the patented technology. In doing so, the court rejected defendants' position that, under a recent California appellate court decision, an ethical wall was sufficient to avoid disqualification. "[Kirk v. First American Title Insurance Company, No. B218956, 2010 WL 1346403 (Cal. App. 2 Dist. Apr. 17, 2010),] arguably broke new ground among California courts for unambiguously approving for the first time the notion that an 'ethical wall' may be sufficient to prevent imputed disqualification of a firm when it hires an attorney 'tainted' by prior representation of a party adverse to a firm client. This Court would have to break far more new ground, however, to disregard its conclusion that there is a substantial relationship between [defense counsel's prior representation of plaintiff in opposing two patent applications] and this action, and not disqualify [defense counsel] under the facts here. . . . [T]his is not a situation where [defense counsel] hired, but immediately walled-off, a 'tainted' attorney. . . . Nor was the ethical wall erected at all until after [plaintiff] complained. Additionally, although it appears that the attorneys who would be shouldering the primary load during this litigation are geographically isolated from the [defense] attorneys who represented [plaintiff], [defendants'] local counsel of record is not, and the local office is relatively small." Plaintiff's motion to dismiss defendant's false marking counterclaim as barred by the statute of limitations was denied. The court rejected plaintiff's argument that "because [defendant] alleges that [plaintiff] began falsely marking more than five years ago, [defendant's] counterclaim is time barred. . . . Under 28 U.S.C. § 2462, a proceeding for enforcement of a penalty 'shall not be entertained unless commenced within five years from the date when the claim first accrued.' The false marking statute 'requires a fine to be imposed for every offense of marking any unpatented article.' . . . Thus, a new claim for false marking accrues and resets the limitations period each time an article is falsely marked. Accordingly, to the extent [defendant's] false marking claim is based on false markings that occurred prior to [five years before defendant filed its counterclaims], the claim is barred by the statute of limitations." The court sanctioned plaintiff for "unjustified delay, inexcusable conduct, and bad faith" in discovery by ordering production of all of the documents listed in plaintiff's privilege log. "The efforts of the plaintiff . . . to delay and obstruct the discovery of non-privileged and non-work-product documents that appear on the various privilege logs reads like a short book. Unfortunately, the facts present a non-fiction story instead of a fairy-tale. The only thing fictional was [plaintiff's] assertion in its pleadings that it was complying with the Civil Rules. . . . The Court finds that the unjustified delay, inexcusable conduct, and bad faith by [plaintiff] compels the serious sanction of requiring the production of all [1,553] items on the February 2010 privilege log. There is no lesser sanction that will address the misconduct of [plaintiff]." Damages opinion on related licenses was excluded from evidence where alleged connection with the patents-in-suit was being "in the same field"
The court granted defendants' motion to exclude the testimony of plaintiff's damages expert to the extent such testimony relied on allegedly similar license agreements. "The Court . . . finds [the expert's] report inadequate for failing to support his conclusion that the relied on licenses are comparable to the hypothetical agreements between Plaintiff and Defendants. [The expert] concluded each license agreement is comparable to the hypothetical agreement by simply reciting 'I understand that this technology is in the same field of technology as are the Patents-in-Suit.' To support this statement, [the expert] merely cited to 'Interview with Andrew Walding,' the Plaintiff’s technical expert. [The expert] did not detail the substance of his interview with Mr. Walding nor did he offer further explanation or rationale to justify his conclusions the license agreements pertained to comparable technology. Furthermore, [the expert] failed to explain whether the license agreements pertained to patented inventions that were essential to or only a small feature or component of the overall product." 78. TriPharma incorporates paragraphs 1 through 70 in support of this claim for relief. 79. Defendants, without TriPharma’s consent, marked and continue to mark, used and continue to use in advertising, offered and continue to offer for sale, and/or sold and continue to sell the Mandura Product in the United States and in this District with “US Patent #6,899,892,” the 892 Patent number, the word “patent, and/or the word “patented” with the intent of counterfeiting or imitating the Original Product and/or deceiving the public and inducing them to believe that the Mandura Product was made, offered for sale, and/or sold by or with the consent of TriPharma. At no time did TriPharma ever consent to allowing Defendants to use or refer to the 892 Patent. 80. Defendants’ false marking of the Mandura Product with the 892 Patent has been and continues to be willful and deliberate. 81. As a direct result of Defendants’ false marking, TriPharma has suffered and will continue to suffer injury and damages for which it is entitled to relief under35 U.S.C. Section 292, including, but not limited to, a fine up to $500 for every such offense. In prosecuting this claim for relief, TriPharma is acting on behalf of the United States of America and is entitled to receive 50% of the damages. Defendant ANDA applicant's motion to stay pending the resolution of the ANDA was denied. Defendant sought a stay because the drug subject to the ANDA was covered by multiple patents, some of which received a Paragraph III certification, meaning the ANDA would not be approved by the FDA until those patents expired four years in the future. As a result, defendants' hoped-for success in the instant litigation would trigger the 75-day window during which defendant would have to begin marketing its drug. 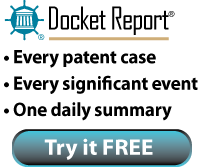 Defendants' failure to do so -- a likely event given that the patents subject to the Paragraph III certification would not expire for four more years -- would forfeit the 180-day period of market exclusivity defendants would otherwise enjoy by virtue of being the first to file an ANDA for the patented drug. "Admittedly, Defendants have shown that they will be harmed if a stay is not entered, as they will likely forfeit their 180-day exclusivity period. Defendants, however, have only themselves to blame for this result. . . . Although Defendants did not file this suit, they were well aware that their ANDA triggered the start of a 45-day period for Plaintiffs to defend the validity of their patents, and, in this sense, did control the timing of the present litigation. Rather than wait until they could fully take advantage of their position as first filer, however, Defendants sought to prematurely reserve their place at the front of the line, and now seek an order from this Court that allows them to preserve that position. This is not the type of hardship or balance of inequities that can appropriately convince this Court to issue a stay in the present proceedings." The court set plaintiff's fine for false marking at $0.35/unit. "[B]y penalizing [plaintiff] at a rate of about 32% of [plaintiff's] overall average sales price of $1.07 per [product], the fine is substantial enough to enforce the public policy embodied in the statute and to deter any similar violations in the future. On the other hand, by not imposing a disproportional liability for what appears to be an 'inexpensive mass-produced article,' the fine serves its deterrent function without over-penalizing [plaintiff]." In determining the appropriate fine for plaintiff's false marking, the court rejected "[plaintiff's] proposal that the Court only assess fines for those capacitors that were shipped with a falsely marked label. As [defendant] correctly points out, during the relevant time, [plaintiff] also advertised the [product] in its catalog and on its website as practicing the [patent]. . . . [J]ust because [plaintiff] did not mark all of the shipped [products] with the [patent] does not change the fact that it violated the statute by using the [patent] in advertising all of those [products]." Read more about false marking cases here. Defendant's motion to dismiss plaintiff's direct infringement claims for failure to state a claim was denied without prejudice. "[Defendant] moves to dismiss [plaintiff's] direct infringement claims under Rule 12(b)(6) arguing that the patents-in-suit require the participation of multiple parties in order for direct infringement to occur. . . . To the extent that [defendant] is arguing that it cannot infringe the patents -- and therefore [plaintiff] could not have adequately pled infringement -- because [defendant] does not direct or control all of the infringing elements, that argument is premature at this stage of the case." In denying defendant's motion to transfer venue, the court rejected the argument that plaintiff's decision to locate its office in the Eastern District of Texas was an attempt "to manipulate venue in anticipation of litigation," as prohibited by In re Hoffmann-La Roche, 587 F.3d 1333, 1337 (Fed. Cir. 2009). "The Court is not persuaded that a corporation’s decision where to locate its offices is the type of 'prohibited activity' that the Federal Circuit had in mind. Unlike transporting 75,000 pages of documents, a business opens its doors in a particular location for a number of considerations, including the cost of rent, market profitability, cost of doing business, and tax benefits. The Court declines to scrutinize litigants’ business decisions in order to determine whether opening an office in a particular location has a legitimate business purpose or is merely a 'tactic . . . to manipulate venue.' Moving a business to a particular location is not the type of activity that, on its face, serves no purpose but to manipulate venue." In denying defendant's motion for summary judgment of invalidity based on anticipation, the court prohibited defendant from relying on a prior art reference that was mentioned twice in its motion but "heavily" relied upon it its reply. "By failing to adequately explain its reliance on [the reference] or cite to it in its statement of facts, [defendant] has denied [plaintiff] an opportunity to properly respond to the more specific anticipation arguments made in its reply brief. While [defendant's] behavior may fall short of waiver, the Court finds it would be inequitable to rely on [that reference] to invalidate [plaintiff's] patent, as doing so would entail relying on arguments to which [plaintiff] did not have a proper opportunity to respond." Defendants' motion for more definite preliminary infringement contentions was denied. "[T]his Court finds that the traditional mechanism of serving interrogatory requests is sufficient to narrow the issues and determine the infringement contentions in this case. [Defendants] had ample time in the Eastern District of Texas, under their governing patent local rules, to move for more definite PICs. Instead, [defendants] chose to transfer the case to the Central District of California, and [they] can no longer look to the rules of a district [they] sought to leave." May an inventor previously employed by plaintiff's predecessor-in-interest serve as an expert for defendant? Yes. Plaintiff's motion to disqualify defendant's expert who was the inventor of the patent-in-suit was denied. "At the time of the development of the [patent-in-suit], [the expert's former employer] and [plaintiff] were competitors. Both have since been acquired by the same parent company. . . . [The expert's former employer] has assigned the [patent] to [plaintiff], but [plaintiff] has presented no evidence or authority to support the proposition that the confidential relationship between [the expert's former employer] and [defendant's expert] thereby was extended to [plaintiff]." Everpure, LLC v. Selecto, Inc., 2-09-cv-02844 (CACD April 6, 2010, Minutes) (Matz, J.). No. Plaintiff's motion to disqualify defendant's expert consultant who was an inventor of two of the patents-in-suit was granted. "It is undisputed that [defendant's expert] signed a confidentiality agreement with [his former employer]. . . . However, [defendant] argues that [its expert] never had a confidential relationship with [plaintiff] because [he] had left [his former employer] three years before [plaintiff] purchased [his former employer's] assets. . . . Although most of the disqualification cases involve employees who previously worked for the moving party, the Court sees no reason why the same principles should not apply to a prior employer’s successor-in-interest. . . . The focus is on whether the disclosure was reasonable at the time; it is irrelevant that the subsequent successor-in-interest never directly employed the party." Broadcom Corp. v. Emulex Corp., 8-09-cv-01058 (CACD April 5, 2010, Minutes) (Selna, J.). Defendant's motion for discovery sanctions was granted. "[I]t is not lost on the court that Plaintiff did not provide the second supplemental privilege log until after the instant motion was filed and on the same day as it filed its memorandum in opposition to the instant motion. . . . [T]he court will not tolerate this type of discovery gamesmanship. Plaintiff should have provided the kind of detail in its original privilege log that it finally provided in its second supplemental privilege log. Defendants should not have to resort to court intervention to get the information to which they are entitled." In denying defendant's motion to stay pending ex parte reexamination, the court concluded that reexamination statistics weighed against a stay. "According to the PTO’s Ex Parte Reexamination Filing Data dated June 30, 2009, upon reexamination all claims in a patent are cancelled 11% of the time and the patent claims are changed 64% of the time. The statistical unlikelihood that the patent will be cancelled weighs in favor of denying the stay. The probability that some of the claims may change after reexamination weighs in favor of staying the case, but that can be handled if and when it occurs." In granting plaintiff's motion to declare the case exceptional warranting an award of attorneys' fees, the court rejected defendant's argument that its "shortcomings in its pre-filing investigation may be attributed to the fact that [plaintiff] filed this declaratory-judgment action and, therefore, [defendant] was forced to respond. . . . [I]t would not be unfair to suggest that a patentee have a reasonable basis for believing a potential target has infringed before it makes its first demand that the target purchase a license to use the invention or face the probability of an expensive infringement suit." In granting plaintiff's motion for a permanent injunction, the court found that monetary damages were insufficient. "According to the plain terms of [an earlier license of the patents-in-suit], [plaintiff] promised that he would not license the technology at issue to any other third party. Failure to enter a permanent injunction in this case would result in [plaintiff's] unwilling violation of that promise, which would have an unavoidable and undeniable effect on [plaintiff's] future licensing negotiations. . . . Although one could describe [plaintiff's] only commodity as patents and his only concern as being paid royalties for their use, that focus is too narrow. [Plaintiff] does more than collect royalty checks in arms length transactions with random licensees. Instead, [plaintiff] is in the business of building long term relationships with leaders in the window blinds industry. . . . Harm to those relationships, and the resulting loss of these, and other, tangential benefits, cannot be quantified and remedied completely with money." Plaintiffs' motion for enhanced damages was granted where (i) "[t]he evidence at trial clearly supports a finding that [defendants] deliberately copied [plaintiffs' product];" (ii) "[defendant] dragged its heels in investigating its potential liability under the patents and, in fact, did not even attempt to redesign its products until almost a year after the present lawsuit was filed;" (iii) "the record is replete with instances where Defendants pursued a course of conduct that had the effect of unduly burdening the Court with unnecessary matters and prolonging the litigation;" (iv) "claim construction was not a close call" and "[defendants'] defenses were weak, at best;" (v) "[defendants] continued to infringe for more than two years after learning of [plaintiffs'] patents;" (vi) "[defendants] sold infringing products for several years after it became aware of [plaintiffs'] patents [demonstrating] that [defendants] recklessly ignored an obvious risk;" and (vii) "[defendants'] employees admitted that they were offering a lower price to attract customers, and admitted that their prices could have been discounted as much as 50% off what [plaintiff] was offering." Defendants' motion for attorneys' fees under Section 285 was granted. "It was obvious from very early on that plaintiffs had brought and were maintaining this lawsuit in a desperate effort to keep any competing product from hitting the shelves -- even if the competing product was not an infringing product. For choosing that bad faith business strategy, and for cluttering a busy court with work that should never have had to be done, [plaintiffs] should pay the full measure of the fees and expenses incurred by defendants in getting rid of [plaintiffs'] baseless lawsuit."